As many of you know, I’m a filmmaker and undergraduate film student and like any other nineteen-year-old Internet user, I loved BuzzFeed Video. Note the past tense. I used to drool over the idea of making videos for such a massive and millennial oriented website. So when I met a BuzzFeed Video recruiter at my university’s Cinematic Arts Career Week this March I jumped on the opportunity. After showing the recruiter my resume he urged me to apply online for their “Summer Video Internship” at BuzzFeed’s headquarters in LA. I went back to my dorm and applied the same day. The simple online application asked for a link to my “creative samples/portfolio” so linked them to my best short film, “The Diagnosis” that I made and posted on YouTube in 2013. “The Diagnosis” got me into film school and even won Best Student Film at the Clifton Film Festival and I felt confident it would help me to stand out. I may not be the first person to point out the stigma attached to mental health and its contrast to the way physical health gets treated, but BuzzFeed created this video suspiciously close to when they reviewed my film for their intern position. Ordinarily I would feel thrilled that such an influential company addressed the topic of mental health stigma, but when I dreamed about seeing my film go viral on the front page of BuzzFeed I never imagined it would be through plagiarism. When I shared this film with BuzzFeed I never authorized them to use or copy my original creative property. Because I applied to work there, BuzzFeed could have easily asked for my permission and/or provided credit where credit is due. But instead they took advantage of a naïve student filmmaker with a flimsy YouTube Creative Commons License and no money for lawyers. After all, why would BuzzFeed hire or pay the creator of content they wanted to use when they could steal it for free? BuzzFeed gets to profit off of this intellectual property violation and I am not the first content creator who had BuzzFeed steal their work without acknowledgement. Unlike BuzzFeed, I never made “The Diagnosis” to make money. I made my short film with a budget of zero dollars and zero cents, and then released it for free on YouTube so that the message could access the audience I felt it deserved. Worst of all, I made “The Diagnosis” about my deeply personal struggle with shame and stigma when I was first diagnosed with depression. My short film became a way for me to process and cope, as I based the characters and dialogue off of real people and conversations from my life. For BuzzFeed to cheapen my experience by stuffing my original film into their repetitive video formula and stamping their logo on it is not just plagiarism or taking advantage of a student, it’s extremely disrespectful. But if I have learned anything from my experience with mental health stigma, it has been not to let anyone silence me. Not even my former-favorite website. People associate mental disorder with violence. We found that crime and mental disorder are linked, but not in the way people think: Persons with severe mental disorders are terribly vulnerable to victimization. I thought, given recent discussions here and elsewhere following the horrible events of last week in Newtown CT, this was a really appropriate time to reblog this quote that I transcribed in the summer. 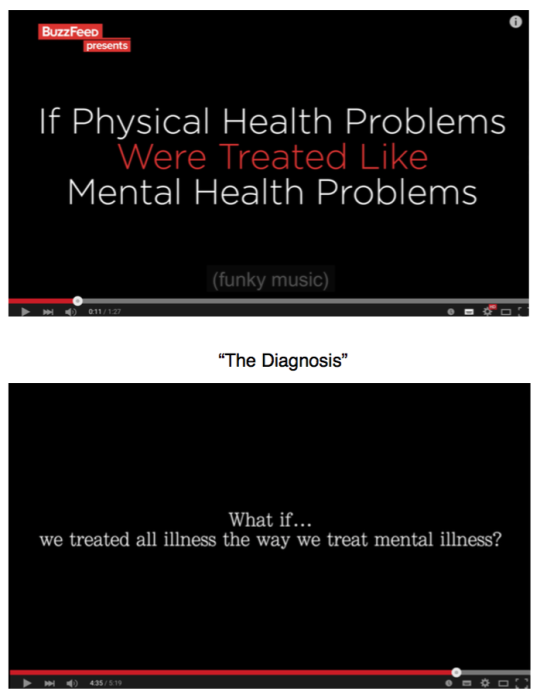 There are several obvious problems with this, starting with the fact that the phrase “mental illness” encompasses innumerable types of conditions that are as similar to each other as Taylor Swift and Morgan Freeman. The fact that people treat the term “mental health” as though it is one giant indivisible blob of entity is problematic in that it is highly reductive, and very telling of their idea of how best to solve “problems” related to mental health patients. Next, by using the umbrella term “mental health” to express their assumption about the gunman, these people – unintentionally or otherwise – paint a picture of all mental health patients being highly volatile, dangerous, and fully capable of committing cold-blooded murders, even if they may only have in mind a specific kind of mentally ill person, whatever the “specific kind” is. The wide propagation of this stereotypical image has very real and harmful effects on the lives of mental health patients. I know this because I’ve witnessed this discrimination, which runs from the structural level to the interpersonal level, first hand, on way too many occasions. I have seen how people treat my brother differently. It is as though they think he will do something scary or disgusting without warning, even though he shows no signs of harm. It breaks my heart every single time. I have spent my whole life trying to fight this harmful stereotype and stigma, and the further propagation of it by people who probably do not connect with a mental health patient on a personal level is definitely not going to make this fight any easier. Understandably, people – including myself – are running high on strong emotions because of the compassion and sadness they feel for the victims, and bringing the gunman down is the most natural thing to do. Regardless, the careless usage of the phrase “mental health"in describing the gunman before any concrete evidence of the gunman’s circumstances is irresponsible and has wider negative consequences. This essay is worth reading in its entirety. While it is probable that the shooter had some form of mental illness (episode) the blanket use of the term makes me, as a person who’s struggled with depression an mild psychotic symptoms, uneasy as well. Also, even though these mass shootings are often done by perpetrators with some type of mental illness (even undocumented/undiagnosed/untreated) so many cases of gun violence are conducted by ‘healthy’ people – street violence, domestic violence, hate crimes. The more I watched, the more confused I became. What the hell was this all about? I wondered. What could it possibly mean? Toru, the narrator, returns to the ‘real’ world after spending a few days in a unique sanatorium visiting a friend.